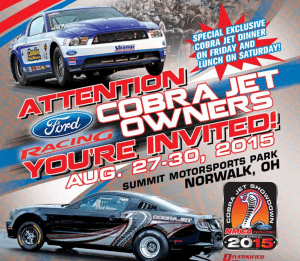 The Summer 2015 Cobra Jet Showdown, A special event to be run in conjunction with the 14th Annual NMCA World Street Finals at Summit Motorsports Park in Norwalk, Ohio, August 27-30, 2015. All 2008-2015 Cobra Jet owners are invited to participate at the Showdown with the opportunity to compete in two races for the price of one, the Friday/Saturday Showdown class and the Sunday Cobra Jet Bracket race. The weekend kicks off in style following Friday’s Cobra Jet Showdown qualifying with the Watson Racing Cobra Jet Racer Appreciation Dinner at Summit Motorsports Park. The Cobra Jet Showdown class will pay $1,000 to win + custom jacket & award and $500 to runner-up. The race is scheduled to be completed on Saturday, August 29th, so competitors can travel on Sunday to Indy to get in line for the NHRA U.S. Nationals. The Cobra Jet Bracket race takes place on Sunday, August 30th, for Cobra Jet racers who want to stay the entire weekend and it pays $1,000 to win + custom jacket & award and $500 to runner-up.